This is a picture of myself, at the Western Wall. 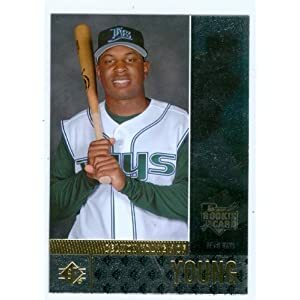 It’s a Delmon Young rookie card. Jordan gave me this card three months ago when I left for my three months in the holy land. I brought it around with me in my backpack all across this country. Delmon saw everything Israel had to offer, whether he wanted to or not. The Galilee, the Negev Desert, Tel Aviv, and of course the Western Wall. Bringing baseball’s strongest anti-Semite with me throughout the trip might have been insensitive, but so what. I go back home tonight to America. I’ll miss some stuff about Israel, but staying up until 2 in the morning to watch games back at home won’t be one of them. I shall flee the land of milk and honey for the land of hot dogs and baseball and I could not be more excited. Delmon, on the other hand, has plans to make aliyah and serve the Jewish people by joining the Israeli Army. This entry was posted in Randomness, Uncategorized and tagged America, delmon young, Israel, Judaism, Religion, Western Wall.